Ischia is the principal town of the island of Ischia, and is located on the north-eastern coast of the island. 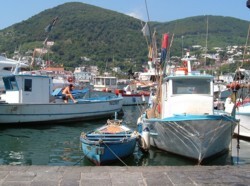 The town is divided into two distinct settlements, Ischia Ponte and Ischia Porto. Ischia Porto, named for its port, is the arrival and departure point for most of the island's ferry services. The island's circular port was once a volcanic crater which filled up with water to become a lake. It was opened up to the sea in 1853, and now accommodates large ferries (who squeeze carefully through the narrow opening), hydrofoils, yachts and fishing boats. The town is lively with visitors passing through, or remaining to enjoy a drink or meal at one of the many restaurants and bars alongside the harbour. At night the area is one of Ischia's busiest, with various piano bars offering evening entertainment. The town makes a very good base for the tourist who wants to see the area. Various independently-organised boat-trips depart from the harbour, taking visitors around the island, to beaches and sights, or to the beautiful nearby island of Procida. From the bus station in Ischia Porto it's easy to take buses to other towns. For holidaymakers who don't wish to travel further afield, there are some popular beaches along the shore in either direction, including the Spiaggia dei Pescatori, towards Ischia Ponte. Inland, a green and leafy spa park lies on the slopes between the two towns. A military thermal spa was constructed in 1876 to cater for soldiers, on the site of a casino belonging to the Bourbon royalty of Naples.